BrainMaps Analyze is a powerful tool for applying image analysis routines to BrainMaps.org image data. There are currently two versions available: 1) a MATLAB version for Windows, Mac, and Linux, and 2) a command-line version for Mac and Linux (see below). The image above is a screenshot of BrainMaps Analyze (Matlab version) performing granulometry analysis on this image. The top left image is a thumbnail of the mouse brain section. 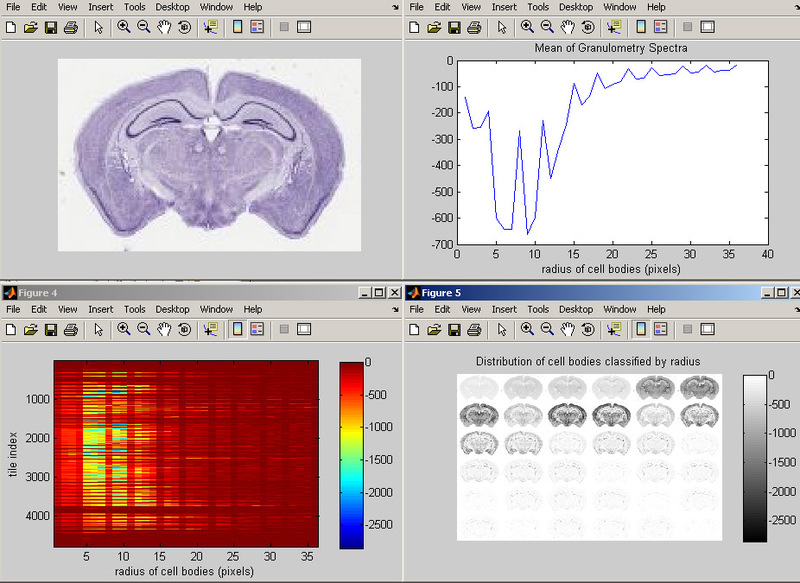 The top right image shows the average (over tiles) granulometry spectrum, showing prominent peaks for different sized cells. The bottom left image contains a plot of cell size (x axis) vs tile number (y axis). The bottom right image is a plot of cell sizes, starting from radius equal to 1 pixel in the upper left, and incrementing by one in left to right, until it reaches radius of 36 pixels in the bottom right image. Note that the original image is over 22,000 pixels wide, and that the computation of granulometry was done on a per-image-tile basis, where each image tile is 256x256 pixels. The BrainMaps Analyze code can be readily extended to include any types of image analysis. The MATLAB program is provided below and may be run from within MATLAB. It is licensed under the GPL. The download also includes sample results, which may be plotted in Matlab by typing 'bmanalyzePlot'. There are four functions in the above download: 1) bmanalyze, 2) bmanalyzePlot, 3) bmanalyzeInfo, and 4) bmanalyzeGetPaths. These functions are described below. % BMANALYZE Run analysis routines on BrainMaps.org high resolution tiled brain image data. %   tile basis to brain image at url at the highest level of resolution. %   straightforward to add your own functions by editing the code below. %   tile basis to brain image at url at the given level of resolution. %   of results BMANALYZE produces, try BMANALYZEPLOT. %   Run Granulometry analysis on coronal mouse brain Nissl section. %   See also BMANALYZEPLOT, BMANALYZEINFO, BMANALYZEGETPATHS. % BMANALYZEPLOT Plot BMANALYZE results. %   Plot results from granulometry analysis on coronal mouse brain Nissl section. %   See also BMANALYZE, BMANALYZEINFO, BMANALYZEGETPATHS. %   See also BMANALYZE, BMANALYZEPLOT, BMANALYZEGETPATHS. % BMANALYZEGETPATHS Retrieves URLs for brain images from BrainMaps.org. %   URLs retrieved by BMANALYZEGETPATHS may be used for BMANALYZE input. %   See also BMANALYZE, BMANALYZEPLOT, BMANALYZEINFO. The source code is provided below and may be compiled using GCC (GNU C Compiler). It is licensed under the GPL. There are currently two image analysis routines that may be applied to BrainMaps image data: computations of 1) entropy, and 2) standard deviation of pixel values. Images at BrainMaps are composed of image tiles of size 256x256 pixels. BrainMaps Analyze performs image analysis on a per-image-tile basis and then maps the results of each computation to a corresponding pixel location, resulting in a lower-resolution map of the image analysis results (as shown in the image above). Users are free to create their own image analysis routines to be used with BrainMaps Analyze. BrainMaps Analyze has been downloaded a total of 3655 times.